This project extended the citizen science approach to transcription to station data. 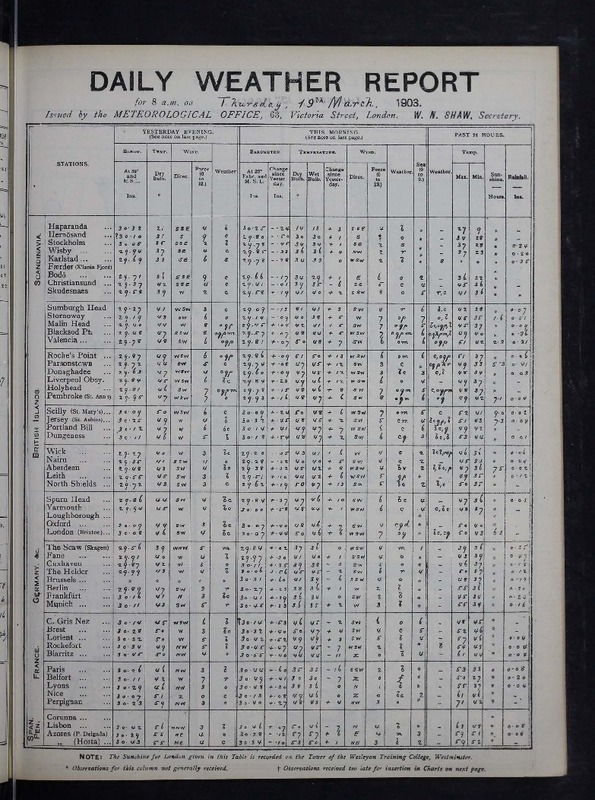 It set out to transcribe UK-region station observations from the Daily Weather Reports for the period 1900-1910 (sample page). It was built on the Zooniverse infrastructure, in particular their project builder tool - which meant that the website could be put together with no cost except for the researcher time to build it. A major change from previous citizen science transcription projects is that volunteers were not presented with a whole page to transcribe. Instead the page images were divided into subsections by the project team, and the task given to each volunteer was reduced to transcribe only a few numbers from a page fragment. The ‘Weather Rescue’ project was led by Ed Hawkins. It used the Zooniverse.org platform, development of which is funded by generous support, including a Global Impact Award from Google, and by a grant from the Alfred P. Sloan Foundation. The financial cost of this project was limited to the researcher time needed to set up and run it. We estimate this at about a quarter of one climate scientist’s time over 9 months. Estimating their total cost (salary + overheads) at an arbitrary £70,000 per year gives a £15,000 management cost. Each observation takes only a few seconds of volunteer time to transcribe, but each was done by 5 volunteers to ensure the accuracy of the result, so effort/ob. is around 30 seconds. Citizen science does work for transcription of ‘boring’ weather-only documents. (We thought that oldWeather was successful partly because the ship’s logs it was transcribing contain records of human interest, as well as weather observations. But the DWR observations are data-only, and this project still worked well). Sub-dividing a page of observations so that each volunteer only needs to do a small task (instead of a time-consuming whole page) is a good idea. The Zooniverse project builder tool works well.